When you notice age spots or patchy skin, you know your skin is producing more melanin than necessary. If you are going through skin darkening that refuses to improve despite your sincere efforts, Kaya Clinic can help you out. Kaya’s laser treatment provides the solution for flawless skin that is truly yours. The problem of hyperpigmentation, or simply pigmentation, is that it strips your skin off the natural skin tone. It makes your skin look darker and duller due to the production of melanin for protecting your skin. Melanin prevents the melanoma development. In most cases, it makes your skin patchy in various areas which makes your skin tone look uneven. It is not your fault because there are so many factors that cause the production of melanin to increase to very high levels. For example, problems such as melasma occur due to the hormonal changes that a woman’s body goes through during pregnancy. But that does not mean pigmentation is untreatable. You can use Kaya’s innovative skin lightening treatment to help your skin become patch-free and even toned. Kaya’s Q Switch Laser Treatment gives you results that last for a long time. This is the answer to hyperpigmentation that actually works better than products which are aimed at decreasing darkened spots in your skin. It helps to drastically reduce dark spots from various areas in your body. This is why Q Switch Laser Treatment is recommended for you if you have hyperpigmentation that has affected your skin deeply. You get even complexion, smoother skin that is supple, and glowing skin as well. The Q Switch Laser technology works by aiming concentrated beams that are targeted at particular spots on your skin. The Q Switch Laser helps with the production of collagen. The dermal layer of your skin is heated when the laser light goes into your skin during the treatment. What happens next is your body prepares for battle because of the in-built defense system. It perceives the heating of dermal layer as an attack from an outside particle. Since your body sees this as an injury, more collagen is produced on a rapid basis to help with skin healing and repair at the earliest. This has another added benefit to it. It helps to improve the elasticity of your skin by ensuring that crow feet and wrinkles are decreased. How does the Q Switch Laser technology help reduction in pigmentation? What the Q Switch Laser does is that it gives away pulses that are made up of light energy. This is in fact what is converted into heat. This, in turn, has the effect of releasing the pigment into your skin after it has been broken down into various fragments. These pigment fragments are re-absorbed into your body. The lymphatic system is what ensures that these are disposed of in the correct way. This helps to ease the dark spots that are found in your body. This helps bring back your naturally glowing skin color back while ensuring your skin becomes firm and aging of skin is delayed. Kaya provides you with the best route to achieve your true fairness without any pain at all. The Q Switch Laser Treatment is great for all skin types and is perfectly fine for the Indian skin type. This is what makes it absolutely effective and ensures that your true beauty comes to the fore while detanning you in the process. You get additional benefits such as luminous skin that look moisturized and soft skin that you are going to be proud of. Speak to Kaya’s dermatologists today to book an appointment and to fully understand the Q switch laser treatment for reducing pigmentation visibly. When a woman sees unwanted hair growth on her face, she is not happy. A woman’s face is supposed to be smooth and hairless except for her eyebrows and eyelashes, so, can laser hair removal for the face prove to be a good solution? A faint line of a mustache, chin hairs, sideburn hair, neck hair - these are the main areas of concern for women. Waxing, threading, tweezing, shaving, epilators, hair removal creams - women try everything to get rid of this hair. All these methods need repeat sessions to prove effective. Methods like threading and waxing can be very painful, though they may give more lasting results than shaving. These hair removal techniques also need expert handling, so women visit beauty parlors frequently and the costs add up. Is there a better solution? Yes, there is, in laser hair technology. Laser hair removal is very effective and the effects last much longer than with other traditional methods like waxing. You also need not wait for hair to grow out of the skin’s surface for the next session. Kaya Clinic is the leading skin care center for every skin and hair care need. Kaya offers US-FDA approved laser hair removal techniques, deemed safe for use on Indian skin, like the ND-Yag laser Kaya Hair Free Gentle Touch. Traditionally, a laser was used mainly on fair-skinned people with dark hair. This is because the laser needs high contrast between skin and hair tone to correctly target the darker hair pigment and avoid damaging the skin. However, newer technologies like the ND-Yag laser also work on dark skin with darker hair. The slight difference is enough for these lasers to hone in on the dark hair shafts emerging out of the hair follicles deep within the skin. The laser beams heat up and destroy the follicles, preventing hair regrowth. Kaya uses two FDA-approved laser techniques - ND-Yag, and the Diode Laser with DualChill tip. When you visit Kaya, a dermatologist examines your face. Depending on the treatment area, hair coarseness, hair density, skin type, skin sensitivity and other factors, the doctor determines which laser technique will be appropriate. A laser is a highly effective technique, but you need to attend more than one session because laser only works on hair that is in the Anagen or growth phase. Many of your hairs may be in the intermediate Catagen phase or the resting period known as Telogen. When these hairs start to grow, you will need another session. Generally, depending on the area, three to six sessions are needed at a minimum for the best effects. You will change into a hospital gown and lie down comfortably while the trained technician prepares to give the treatment. First, she cleanses your face to remove any dirt, makeup etc. The target area is shaved. This is done to ensure there is no hair growing out of the skin, which might cause the laser to damage your skin. After this, the technician places a protective cover over your eyes to shield it from the laser light. She highlights the treatment region with a marker to act as a guide when using the laser. Then, a cooling gel is applied to the marked areas. She picks up the laser machine and applies the laser in a circular motion slowly moving across the marked region. When the process is over, she wipes off the gel. Then a cool, soothing post-treatment cream is applied. This also contains sunscreen, which is extremely important after you have had laser treatment because your skin becomes very sensitive for a few days. You are then free to leave and resume your normal routine, but you have to shield the treated area from the sun. You will also be given instructions for post-treatment care that you will have to follow. At Kaya, the treatment is conducted by trained, certified and experienced technicians, under the guidance of a dermatologist. It is done in a safe and hi-tech clinical setting. So you may rest assured of the safety and efficacy of the therapies. Read Kaya skin clinic laser hair removal reviews on the web. If you are worried about Kaya skin clinic prices for laser hair removal, Kaya can arrange for financing to let you pay the cost in EMIs. How Does Sun Exposure Cause Skin Ageing? Ageing is a natural process, there are several intrinsic causes of ageing. However, many studies have shown that the major cause of the external signs of ageing is exposure to sunlight. It is the UV rays that cause the harm. Why Should You Shield Yourself From the Sun? The sun is the giver of light and life on earth, without the sun, nothing can survive. However, when you expose yourself too much to direct sunlight, it can cause a lot of harm. It is the ultraviolet rays from the sun that are the culprits here. The sun’s UV spectrum consist of three rays that reach the earth’s atmosphere. UVA, UVB, and UVC. Fortunately for us, the ozone layer is still up there to filter out the UVC rays. However, the A and B rays still reach the earth’s surface. UVB rays are short wavelength rays that have long been associated with skin cancer. UVB rays are more intense and also cause sunburn. UVA have a longer wavelength and penetrate deeper into the skin. When the ultraviolet rays enter your skin, your body has a natural line of defense in the form of the pigment called Melanin. This pigment is the chemical that gives color to your skin, hair and eyes. It also protects you by absorbing and dissipating the UV rays. The UV rays also begin to breakdown structural proteins like collagen and elastin. Collagen in skin gives structure and firmness. Elastin makes the skin smooth and supple, the sign of a youthful skin. Together, these proteins give your skin shape, volume, and elasticity. When they breakdown visible pores, crow feet, fine lines and wrinkles begin to appear. The skin begins to lose its firmness, resulting in sagging skin, bags and folds. UV rays even have the capacity to damage DNA. The rays also cause Telangiectasias, a condition where tiny blood vessels called capillaries dilate and become visible under the skin. The sun also increases the amount of free radicals in the body that causes cell damage and mutations, suppresses the body's immune system and reduces antioxidants. All these can together lead to skin cancer and other damaging effects. The WHO published a report that outlined the dangers of too much time spent under direct sunlight. It concluded that around 90% of the visible signs of aging is caused by the sun’s UV rays. There are other independent studies conducted in many countries, across different ethnic groups that also prove this to be true. While dark skinned people are believed to have higher resistance to UV rays, they can also be severely affected by too much sunlight. The solution to this problem is not to hide yourself away in a dark room with all the windows shut and curtain pulled closed. The sun is the primary source of Vitamin D, and our body clock works based on sunlight, it is attuned to the rhythms of the sun. Just use sunscreens, wear protective clothing if you have to go out in the bright sunshine. If you want to enjoy the sunshine out in the beach or just standing under a tree in your garden, do it before 10 am or after 4 pm. Even then, wear sunglasses and sunblock if you intend to spend a lot of time under the sun. The sun’s harmful effects on the skin makes you look older than you are. So, is there a way to erase these marks imprinted on the skin by UV rays? Kaya Clinic provides a solution through a cream that acts as an anti ageing treatment. Kaya Dramatic Renew Day Cream contains Niacinamide and Vitamin B3 that work to lighten skin, and reduce dark spots and discolored patches. Zinc Lactate helps regulate sebum production, preventing your skin from looking dull and lifeless. This skin tightening day cream hydrates your skin and kickstarts collagen production. This in turn improves skin firmness, gives your skin a better texture, and fills out wrinkles/ fine lines. Your skin soon begins to look smooth, blemish free and youthful, within just 8 weeks of using this cream daily. Men, Are You Confused About Hair Care? Here Are Some Tips And Tricks To Help You Out! Do you want to always look your best? Don’t forget, proper hair care can give you that extra boost to look super-handsome always. There are some tips that can help you manage your hair in the best way possible without breaking the bank. Hair fall is one of the most common problems that people suffer from every day. However, it is also one of those problems that one cannot get rid of quickly. While some people are lucky to get back their hair quickly, others suffer due to genetics or other problems. When the problems of hair fall occur, it hampers your self-confidence and the way you perceive your life. It can make you stressed out and can cause problems that affect you every day. However, it doesn’t have to be that way. You can use some tips and tricks for hair care. The following are some of the best hair care tips for men to reduce hair fall and other hair problems. ➔ Try to keep styling and drying to a minimum because these can damage your hair beyond repair. The chemicals and the way you treat your hair when you style can damage your hair from within. ➔ Dry your hair without rubbing it. Many of you have the tendency to roughly handle your hair. Yanking it is not going to help you out. You need to softly dry it and this is a hair care tip that can make quite a difference. ➔ It might be a good idea to stay away from chlorine for a while as it can cause scalp problems. Chlorine can make your hair dry and hair fall will eventually occur. ➔ You should use lukewarm water when you wash your hair. This will balance the natural oils on your scalp and ensure that your capillaries are not blocked. This hair care tip will help your hair remain healthy. ➔ You should stay away from frequently getting treatments that consist of chemicals in some form. Sometimes these cause irreversible hair fall. ➔ Maintaining a healthy lifestyle has always been undermined. If you eat right, avoid junk food, meditate and exercise, then your hair will reflect that care. This will make it easy for you to accomplish hair care. ➔ It is advisable that you avoid wearing tight hats. The reason is that it can cause hair fall as hair is pulled. This problem can become a permanent problem. If you want to fully ensure that you are giving the best treatment for your hair, then don’t fret because Kaya is there to help you. You can use Kaya products alongside these hair care tips for best results. Kaya hair thinning solution products for hair fall will help your hair become healthy again. You don’t have to go in for expensive treatments to treat your hair when you have Kaya. Kaya hair care treatment for men is sufficient. kaya Clinic can help give your hair salon-like treatment and reduces hair fall. Kaya provides the best hair care for men in the form of Nourishing Shampoo and Hair Care Gel. The fantastic products can help solve your hair problems. Kaya’s Nourishing Shampoo has been developed for everyday use. It has Almond oil and Hibiscus extracts which help your hair become healthy without any damage. The fragrance is soft and soothing to you and your senses. This shampoo has been formulated to reduce hair fall by ensuring your hair does not break. The dirt from your hair is effectively removed, making your hair smooth and silky. Kaya’s Hair Care Gel is the best product for hair loss treatment without any complicated procedures. The gel has been specially formulated to work at the root of your hair to strengthen it from within. One of the main causes of hair fall is deficiency is certain minerals. The gel ensures your hair gets all it needs thereby ensuring a healthy scalp and a formula that is so light you won’t feel as if you have applied anything. When you use these two products by Kaya, your hair will feel and look healthy. They are perfect for hair care of any type of hair. Kaya provides the best service for hair fall and enables you to become confident every day. The products are developed by dermatologists and specialists to ensure safety and effectiveness in controlling hair fall. A soothing facial is always a favorite amongst spa treatments for most women. If we’ve got a facial that promises to restore the youthful glow and suppleness to your skin, and which has also been hailed as the best facial of the century by Cosmopolitan UK, you would like to know all about it, wouldn’t you? This special anti ageing treatment from kaya Clinic uses seaweeds to revive and freshen up your skin tone. There are internal and external causes of ageing. The oxygen that we breathe fuels our. However, the process of oxidation during cell metabolism also produces free radicals that cause tissue damage. As you age, your skin loses the fatty tissues that give form and fullness to skin. This causes skin sagging. There are many external factors that damage your body like sunlight, pollution, dirt, dust, unhealthy diet, smoking, too much alcohol consumption and so on. The UV rays in sunlight are now considered responsible for 80% of the external signs of aging. So, you gradually develop dull and dry skin, age spots, visible pores, and other blemishes. Ultraviolet rays also cause the breakdown of collagen in the skin. This results in other signs of ageing like crow feet, and wrinkles/ fine lines. The solution is to use sunscreens, avoiding the sun during the harsh daylight hours (10am to 4pm), eating a healthy diet, and leading a healthy lifestyle. Regular exercise, drinking enough water each day, having a good skin care routine can all help. Go for regular facials and other skin care treatments at a reputed clinic like Kaya. These pamper your skin and give it the proper stimulation and the nutrients it needs to stay healthy. This is a deep therapy that soothes, hydrates, tones and clears your skin. This seaweed therapy has been hailed as the Facial of the Century by Cosmopolitan UK. This facial uses freshly harvested European seaweed to rejuvenate the skin. It is all done by hands no machines are used. 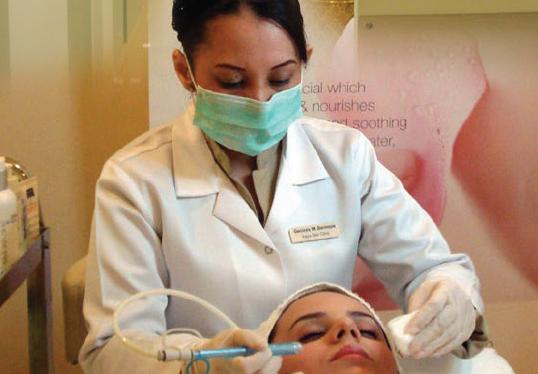 The beauty technician first cleanses your skin, to remove makeup, dirt, and dust. In the first step, a seaweed filtrate in a concentrated form is massaged into your face until it is fully absorbed by the skin. This helps to hydrate the skin, smooth out fine lines, and balance your skin tone. In the next step, a hydrating cream is massaged into your skin. This deep, long, and relaxing hand massage delivers moisture content and helps to restore elasticity to skin that has lost its youthful suppleness. Next comes the specially harvested seaweed mask. The seaweed is preserved using a unique technique to safeguard its freshness and nutrients. First one, then another layer of seaweed is applied to create a mask that delivers nutrients to the skin. This helps to improve skin tone and the skin, clearing blemishes. The final step is the application of a mineral mask. This dries up into a hard mask. As it does, it generates warmth. This warmth helps the skin absorb all the rich nutrients from the layers beneath. After the last layer has completely dried up, the mask is slowly peeled off. Immediately afterward, you can feel the soft and silky texture of your skin. The mask continues to work its magic and your skin looks glowing and young the next day so that even others begin to notice it. The results last for a long time. This skin tightening treatment firms up your skin, removing wrinkles and restores vitality. It relieves stress and removes the effects of stress on your skin. This is a therapy that everyone needs, to reverse cell and tissue damage caused by internal and external factors, to keep you looking young and radiant. When the weather gets colder, it is time to enjoy life in India. It is a relief from the searing heat of the summer months. These cooler months of the monsoon and winter are also the best time to go for laser hair removal treatments. Why? Laser hair technology for permanent hair removal can give you permanent relief from those pesky hair growth issues. If you have your treatment done at a top-of-the-line clinic like Kaya, it can be safe, effective and result in a skin that looks smooth and silky. However, for Laser hair technology to work, you need to take some pre-treatment precautions and post-treatment care. Avoid the Sun: Sun-burnt skin can result in your laser session being put off, because it cannot be done on the tender skin. Tanned skin? That is a no-no too. Yes, kaya Clinic Laser hair technology choices are safe for use on dark skins too. However, If you expose your skin to the sun and make it darker before treatment, you are making the process harder on yourself. In the winter, the sun is not so harsh. And in winter, you generally wear full sleeves and thicker clothes to keep yourself warm. So, the risk of sun exposure is less. Avoid Other Hair Removal Treatments: Waxing and other treatments that pull out hair roots should be avoided. This is because laser hair technology works by focusing in on the dark hair shafts that grow out of the hair follicles beneath the skin. If you pull out your hair by the roots, laser treatment will have fewer hairs to focus on and remove. In hotter weather, you might be tempted to wear shorter clothes to avoid feeling hot. In the winter, you will likely wear full sleeves and pants, to stay warm. So you will not have to worry about hair on your arms and legs for a short while before your laser hair removal treatment. Your Skin Becomes Sensitive: Immediately after treatment, you again need to avoid sun exposure because the laser treatment can make your skin more sensitive for some time. Use sunscreens and moisturisers. Wear full protective clothing. This becomes easier in winter. You Need Multiple Sessions of Treatment: Depending on the target area, hair density and size of the region to treated, you may need more sessions to achieve full hair removal. If you begin in the cooler months, by the time spring arrives, you will be ready to wear those shorts, summer skirts, and sleeveless tops again. Kaya Clinic offers two Permanent Laser hair removal/reduction choices, One uses the Nd-Yag Laser (Kaya Hair Free Gentle Touch) and the other uses a diode laser (Painless Hair Reduction). They are both FDA approved treatments, safe for use in clinical treatments. Read a few Kaya skin clinic laser hair removal reviews. Confirm current Kaya skin clinic prices for laser hair removal. At Kaya, the procedure is carried out by trained and certified laser hair technology experts. Dermatologists first assess your unwanted hair issue and decide which technology to use, how many sessions you will need, the settings to use on the laser hair removal devices and so on. You will stay relaxed and comfortable during the treatment. You may be given a topical application to use on the treated area before you leave, and asked to shield yourself against the sun and dust. After a while, you will begin to see the effect of the treatments. A lot of hair will be removed, some will become shriveled, while some hair might grow again as they enter the growth phase. This is why multiple sessions are needed. Finish a full course and achieve permanent hair removal.